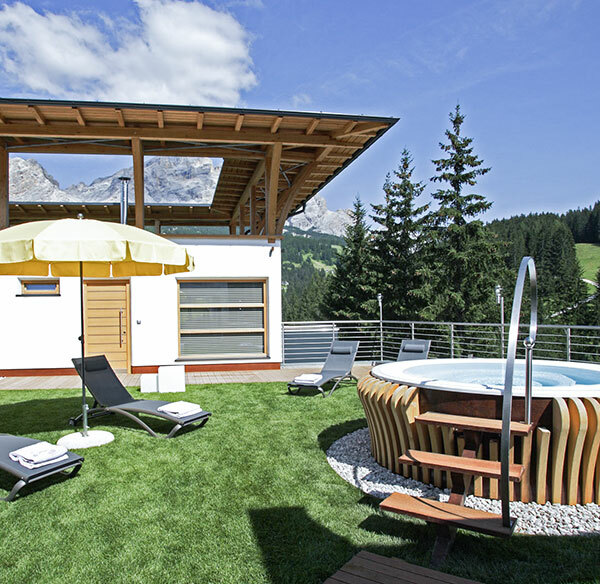 Immerse yourself into the outdoor whirlpool and enjoy a breathtaking view of the Dolomites from our garden terrace. Our outdoor whirlpool, overlooking the Gran Risa and the mountains in Alta Badia, make your holiday a unique experience. In summer, you can experience moments of peace and relaxation, surrounded by the beautiful greenery of the garden during the day or under a starry sky in the evening. The heated outdoor whirlpool with its 38 ° C is a real insider tip, especially in winter. Spend some great moments together in a cozy atmosphere and reserve the whirlpool only for you! The sun terrace with deckchairs is a great pleasure with a 360 degrees view - a pleasure for body and mind.